Scientists and researchers who still haven’t considered Wikipedia to be relevant for their academic career or who perhaps disregard Wikipedia for scientific purposes all together, might have to reconsider their point of view. At least they will have to get used to the fact that social media is sneaking its way into the other-wise so stable and non-surprising world of peer-reviewed journals. The Open Access journal PLoS have taken on the task of making science available for everyone to read. In their endeavor to achieve this they have now gone to a new level, and are trying out the combination: peer-reviewed articles + Wikipedia. By mixing the two together, PLoS hopes to meet a new level of interaction between publishers, researchers and the public. The guinea pig for this experiment is the journal PLoS Computational Biology. By introducing so-called “Topic Pages”, which are a new article type building on the style of a Wikipedia article, PLoS makes peer-reviewed articles which are published in PLoS Computational Biology available on Wikipedia. The benefits of these Wikipedia style articles are 1) that they will help fill a gap in Wikipedia’s computational biology content; and 2) that the articles will be subject to ongoing review of wikipedians. A third advantage, highlighted by Bonnie Swoger in a blog post in Scientific American, is that it may play an important role in convincing scientists to take an active role in adding content to Wikipedia, and in using social media for science communication in general. Bonnie Swoger points out that due to the organisation of universities and other research institutions, using time editing Wikipedia, being on Twitter etc. means less time for lab work, field work and scholarly writing. All of which is what matters in an academic career. Scientists therefor refrain from social media (or at least use it as an excuse). The trick of PLoS’ Topics Pages, which turns peer-reviewed articles into Wikipedia entries, makes it possible for researchers not only to produce original published articles, but also to contribute to public knowledge available on Wikipedia, and thereby potentially reaching much wider audiences. It will be interesting to see how this new concept works out. I could definitely see it as something useful also in public health related research, which due to its public nature is probably even more likely to be found via Wikipedia than topics within computational biology are. For an example of Topic Pages take a look at the article Circular permutation in protein in the Wikipedia format and the same article in a regular journal format. Both were published in Wikipedia and PLoS Computational Biology at the end of March this year. Read more about PLoS reflections on the Journal-Wikipedia alliance in this editorial. If you click on the link in the tweet (or here), you’ll come onto the webpage of PLoS Medicine and an article by McKee M, Stuckler D, Basu S (2012) entitled: Where There Is No Health Research: What Can Be Done to Fill the Global Gaps in Health Research? In the righthand side column (under: “share this article” – which is BTW primarily through social media) you’ll see a box from Twitter, called “What the community is saying”. In this box a roll of all the tweets linking to the article are shown in chronological order with the newest first. The reasons for why people chose to include links to a particular article in their tweets may of course be many. It could be a simple wish to spread word of the article, but could also be comments and reactions to the article and additional links to for example blog posts discussing the article. For the authors of the article this easy access to the Twitter activity concerning their article provides and opportunity to see what the segment, who are on Twitter, are saying about the article – and not least who they are. And for the readers it is a chance to check out who else have found this article relevant. Who knows, they might be people in your area of research you were not yet acquainted with. The Twitter box is of course not unique to the article by Martin McKee & co. but applies to all PLoS Medicine articles. So, your article has been accepted and is now published in a peer-reviewed journal. Great! Now the world gets to know of all your findings and hard work. Or will it? What if no one reads it? You can of course let your colleagues know that your article is out, have the communication department do a press release and things like that. But why not go wider than that? Why not share it with online social networks? That sharing articles on social media can boost the number of downloads, Melissa Terras, whom I blogged about earlier, is a good example of. But also the publishers are becoming aware that social media can help boost the number of downloads, citations etc. SAGE, the world’s 5th largest journals publisher, actually offers guidance on how to increase usage and citation of your article by using social media. This includes getting on Twitter (they even have guidelines for how to use Twitter), contributing to Wikipedia, joining academic networks and making use of Facebook and LinkedIn. And I guess that is the hope of every researcher whom has something published: that it will reach the relevant readers. How do you persuade good old fashion researchers that social media has something to offer them too? You know, the kind who prefers having their papers published in the Lancet, British Medical Journal and Nature. The ones who like giving key-note speeches at prestigious conferences or at least an oral presentation of an abstract. And who frowns or looks completely lost when you suggest that the get a Twitter profile. This is a challenge. But a blog post by Melissa Terras from the Department of Information Studies, University College London made me think, that using a medium these traditional oriented researchers respect, as a tool, could be a way forward. Melissa Terras’ blog post describes how starting to do small blog posts of the stories behind the research published in 26 published articles, and tweet them afterwards, increased the number of downloads of the articles substantially. In the blog posts she wrote about all the stuff that doesn’t make it into the published paper, but then of course linking and referring to the papers too and there by drawing attention to them. It’s really interesting to read her story of how some blogging and tweeting made her articles much more downloaded than her colleagues (which said nothing of the quality of her colleagues work but more of their efforts to spread the word of their research). The blogging/tweeting strategy really seemed to work! It focuses on how you can spread your research to more people, which must be the aim of any scientist: to have others read, learn from and use your findings! It uses numbers and graphs – researchers like that! One ‘downside’ to the case of Melissa Terras could be that her research field is electronic communication and digital humanities. One can almost assume that many of the people in her field are first-movers when it comes to using social media, and therefore blogging and tweeting is effective because her audience is there waiting at the other end of the line. It would be great to find more examples like the one of Melissa Terras, but from non-communication oriented research. Do you know of some? I would love to make a list which could be used in different academic fields to persuade colleagues that there is something in social media for them too. If nothing else its a way to boost the visibility of their published articles, but hopefully it could also help open their eyes to all the other upsides of social media in science communication. Please do share your examples! Social media and peer-reviewed journals. Some people would regard this as two separate worlds and perhaps they were once upon a time, but times change and more and more journals are embracing, exploring new uses and expanding their traditional journal universe with blogs, Twitter accounts etc. An editorial retreat at The British Medical Journal focusing on social media shows that journals and social media are definitely not worlds apart. As I have been on a pre-Easter break I was unfortunately not able to follow the Twitter stream from the meeting, but in the spirit of social media a Storify (a collection of tweets #BMJseminar) from the meeting has been put together. It gives a small peak into the highlights of the meeting. I have previously blogged about the BMJ and PLoS blogs and recently the blog of the International Journal of Public Health. Lately, I have also been following Richard Horton, Editor of the Lancet, on Twitter (@richardhorton1) where he actively tweets about the numerous meetings he attends. At times very entertain and very opinion born. In addition, I just discovered The Lancet student blog, which aims to give medical students from around the world a place to talk about their experiences of medical school life, and their thoughts on the top health issues of the day. The use of blogs, like they are used at BMJ and PloS, is however, as far as I can tell, nothing the Lancet has engaged in. I wonder why that is…. More and more public health related journals are expanding their online universes with blogs. Eg. BMJ and PLoS have blogs associated to their journals. Now one of the smaller journals of Public Health has also started a blog. 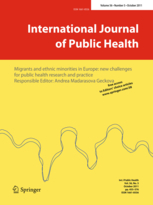 The International Journal of Public Health’s blog is made as a joint venture with the Swiss School of Public Health +. to put this discussion in an open space so that interested public health people from various fields can follow it and make contributions. So far the comments section has not been used much. Whether this is due to lack of interest in commenting or inawareness of the blog is difficult to say as the blog is still quite new, and only was launched early in 2011.